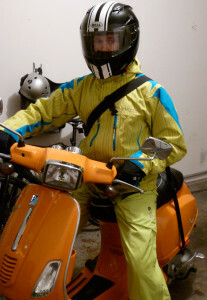 When I committed to riding my scooter Vesper Lynd through the Portland winter, I knew I’d need the right gear. It wasn’t until mid-December 2011 that I realized my waterproof shell trousers and fleece/waterproof shell jacket combo was not going to get me through. Portland’s winters, although relatively mild when compared to, say, northern Ohio, can still get quite chill. Temperatures in the upper 30’s and lower 40’s, braved on a bike going 40 MPH could shrivel my hands into blackened frostbitten claws. My torso might be dry upon arrival at my destination, but it might also be blue and racked with convulsive shivering. And so, like the great northern expeditions of old, I headed to the Columbia store to acquire the intense deep winter coverings I desperately needed. What I came out with is something I’ve taken to describing as my psychedelic astronaut suit. The bright yellow color helps me be seen in the dark December days, when sunlight makes but a cameo. The jacket, a fine Columbia Titanium product, is comprised of two layers – an outer, water- and wind-proof shell and an inner heat-trapping down layer. The pants are Mountain Hardware ski pants, made for all day in the snow and cold. 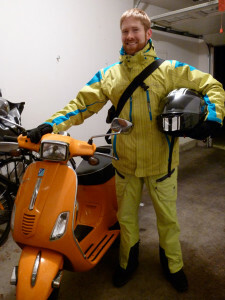 Combined with the Columbia Omniheat gloves that keep my precious hands from freezing and falling off my arms, I have built what may be the perfect winter scooter ensemble. It got me through the winter of ‘11-’12 and is delivering me through the ’12-’13 winter. I arrive to work every morning warm and dry. The suit may be as high tech as Iron Man’s. I certainly feel like Robert Downey, Jr. as I scoot around town. Like the superhero, I feel more powerful while wearing the suit. 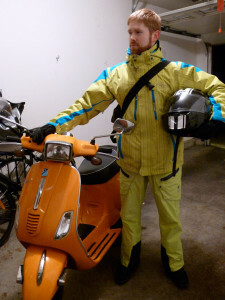 So if you see a psychedelic spaceman scooting around town, don’t rub your eyes. It is not an illusion. I exist. I ride on.